The fact is, you’re already sick long before noticeable symptoms occur and even longer before modern medical science is able to identify or measure any imbalance – assuming they even have the ability to identify and measure imbalance accurately in the first place. …or worse, they walk out believing they’re in perfect health because the doctor has no way of accurately identifying or measuring imbalance before it becomes real disease and end up dropping dead unexpectedly on the way to the mailbox one morning. Why are you sick and tired, whether you know it or not? In other words, stress in the form of oxidation and inflammation which is caused by the amount of toxicity and causticity present in the fluids of the body – capable of burning, corroding, and destroying living tissue – and expressed in terms of pH. A pH scale is a standard measurement system you probably learned about in high school chemistry and then forgot, along with algebra! pH stands for potential of hydrogen. Hydrogen (H) is an element that is one of 9 essential macronutrients and is a building block of all plant, animal, and human organisms – so you could say “it’s pretty damn important,” but only in the proper balance! pH is a measurement of the acidity or alkalinity of a solution – and, being mostly water, you area solution! An acid is a substance that adds hydrogen, and an alkaline is one that removes it – having too much hydrogen released into the body leads to an over-acidic condition. Much like having a certain body temperature, having a certain pH (or level of acidity or alkalinity) is very important because, most bodily functions and many enzymes and chemical reactions work optimally, and many bodily fluids are most stable, at a certain pH. Your blood, for example, should be very close to 7.365, which is slightly alkaline, for you to experience optimal health. Even the smallest change in blood pH has a significant impact on the way your body functions and your overall level of health and vitality. Everything has a pH value and can be measured in a solution. 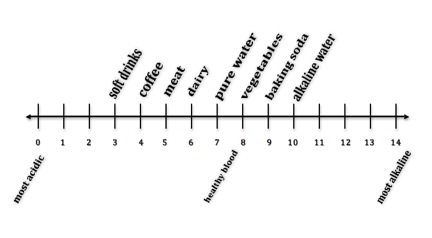 The standard pH scale (pictured below) begins at 0 (which is most acidic) and runs through 14 (which is most alkaline). For a solution to be considered “neutral” (meaning, neither acid nor alkaline) it must be at a pH of 7 which is the accepted pH of pure water at 25 °C. Therefore, solutions with a pH less than 7 are considered acidic, while those with a pHgreater than 7 are considered alkaline (also called basic). This is important for you to understand because acid-forming foods, drinks, and substances make energy withdraws from your body and lead to the expression of sickness and disease. For example, dairy has a pH near 6.5 which is almost 10 times more acidic than pure water; meat has a pH around 5.4 at its most acidic, which is nearly 100 times more acidic than pure water; coffee, with cream and sugar, has a pH around 4.0, which is 1,000 times more acidic than pure water; and soft drinks, at a pH around 3.0, are 10,000 times more acidic than pure water. If I poured acid on your skin, it would burn you – and it does the same thing inside your body. Therefore your body has to buffer this acidity to protect you from it, which takes a lot of energy. That means that these kinds of foods and drinks make major energy withdrawals from your body. On the deposit side, the value of foods like broccoli, spinach, and most other green and yellow vegetables, have a pH of 7.5-8.0 which is up to 10 times more alkaline than neutral; while structured alkaline water from an ionizing machine at a pH of 9.5-10 is up to 1000 times more alkaline. That means that these kinds of foods and drinks make major energy deposits into your body. It’s true that a substance that is too alkaline, like concentrated bleach, can be caustic just like a substance that is too acidic, like phosphoric acid. Therefore, ideally, you want to focus on consuming foods, drinks (especially water), and supplements that are in the slightly alkaline range between an approximate range of pH of 7.0-10.0 to help keep the body in optimal health. In other words, germs do not cause disease conditions, but rather, one disease condition– over-acidification – causes germs. Just like stagnant water leads to mosquitoes and trash leads to rats. Your sick and tired because you’re over-acidic from living, eating, and thinking in a way that has clogged you up, interrupted to flow of vital and nerve energy, and led to cellular breakdown and the overgrowth of microorganisms. You’ve been making more energy and nutrient withdraws than deposits, living on energy credit, and you’re heading for energy bankruptcy, if you aren’t there already. You’re not eliminating the acidity being created by your own body through normal processes or the acidity being introduced into your body through your thinking, breathing, drinking, eating, and environment and this acidity is settling to the weakest areas, determined by stress, injury, and genetics, and is causing cellular breakdown and organ system malfunction. Creating fat to be used as a “parking lot” to store acid away from the blood and vital organs, causing weight gain in the mid-section and hips. Creating mucous to bind with acids and protect the respiratory and intestinal tract, causing congestion. Creating cholesterol to protect against acids damaging arteries, organs, and tissues, causing poor circulation and blocked arteries. Leaching calcium from bones and magnesium from muscles to neutralize acid in the blood, leaving muscles weakened and bones brittle. Taking water, sodium, and carbon dioxide from the blood to create sodium bicarbonate to buffer acidity in the digestive tract – leaving blood more acidic and congested. Using iron from blood cells to buffer acids, leading to tiredness and fatigue. Using hormones from the endocrine system, thyroid, adrenal glands, etc. to help regulate pH, metabolism, and other body processes, in response to elevated levels of stress. And making it impossible to lose weight and gain muscle, no matter how little you eat or how much you exercise. Unfortunately, medical science tends to measure the quantity of these things in order to determine a diagnosis. However, the body is always working to maintain the slightly alkaline balance necessary for life, which causes these “levels” to fluctuate constantly – meaning medical science is measuring what is ever-moving and ever-changing, depending on your lifestyle and environment. When you understand the pH factor of foods and drinks, you’re in control and can choose foods that contribute to your energy and vitality most of the time – such as alkaline-structured water, greens, vegetables, and healthy fats. These kinds of lifestyle choices, made consistently over time and in the majority of your diet, assist the body in neutralizing acidity, eliminating waste, and replenishing Alkaline Buffering Systems™. When you were born, you were slightly alkaline and about 90% water. As an adult, you became more acidic and approximately 70% water. When you die, you’ll be less then 50% water and rigor mortis is a nearly 100% acidic and dehydrated condition so that bacteria, fungus, and mold can proliferate and return your body to the earth for recycling. Therefore, aging and disease is foundationally the result of dehydration and over-acidification and to stay young and healthy you simply need to focus on super hydration and alkalizing the fluids of your body. The human body is alkaline by design and acidic by function, meaning that while your body is always working to maintain a slightly alkaline pH, especially in the blood, the body’s normal processes produce acidity (i.e., lactic acid from muscle metabolism, carbon dioxide from respiratory metabolism, hydrochloric acid from digestion, etc.). Therefore, it’s very important to support the body in eliminating its own acids as well as the other acids building up from your lifestyle choices. Sickness and disease arises through a Cycle of Imbalance that begins with a disturbance of some kind (negative thoughts, words, and deeds, destructive emotions, dehydration, acidic diet, EMF, radiation, polluted environment, and poor elimination of your body’s own wastes). This leads to a declining pH (or higher levels of acidity) and a compromised inner environment which causes cellular disorganization and gives rise to the overgrowth of microorganisms (bacteria, fungus/yeast, and mold) which then feed on the body’s sugars, fats, and proteins and, in turn, produce more debilitating acid wastes that cause more disturbances. Within this Cycle of Imbalance, all of the signs and symptoms of disease are reflected: low energy and fatigue, poor digestion and elimination, overweight or underweight, unclear thinking and volatile emotions, aches and pains, and of course major disorders. Break The Cycle Of Imbalance – ALKALIZE and ENERGIZE! Regardless of where you are now, if you want NEXT LEVEL health and vitality, then foundationally you NEED to focus on ALKALIZING in every aspect of your health and fitness. …inflammation, caused by an over-acidic diet and lifestyle, is the hidden underlying cause and moving to a more Alkaline Diet and Lifestyle is the solution. However, even with the current buzz about alkaline water, drops, and green drinks, you may know that alkalizing is important, but still don’t really know what alkalizing means. In fact, when you hear the word alkaline you may think of batteries – which sounds toxic – and you may wonder what that has to do with your health and vitality. What are alkaline batteries designed to do? Batteries “energize” a machine so it can power on and perform. Better batteries means better and longer performance. Primary batteries, that are alkaline, have the highest energy and longest shelf life. Therefore, you could say that “alkaline” simply means “energized” and “alkalizing” simply means “making energy deposits” to your body – through your foods, drinks, and other lifestyle choices. The simple truth about health is – HEALTH IS ENERGY! If no energy equals no physical life, then doesn’t it make sense that the more energy you have, the better health you’ll have? Therefore, anything that takes away from your body’s energy is disease producing and anything that contributes to your body’s energy is health promoting. How you live, eat, and think. Whether you’re experience peace or stress, anger, and dissatisfaction. Whether or not you’re getting fresh air and plenty of oxygen. Whether you’re consistently hydrated or dehydrated. Whether you consume foods and drinks that “cleanse” or “clog”. The environment you live in and people, places, things you spend time with. And whether your focus is PREVENTION or FIXING in your health strategy. The problem is that people tend to believe they have to go to some kind of extremes in order to get healthy and maintain it and either fail to get started or fail to follow through. But, what if you could experience the health and vitality you want and deserve – REAL Health Freedom™ – without having to go to those extremes or sacrifice the joy of living? By focusing on alkalizing, you can! …and you’re about to learn the 3 Highest Leverage and Easy To Apply Strategies, which you’ll be able to implement immediately without making drastic changes to your existing diet or giving up everything you love. There is a correction for the cycle of over-acidification and a way to have the health and vitality you long for. It happens by taking in resources that are cleansing, rejuvenating, and restoring the body through deep breathing, super-hydration with living alkaline fluids, and nutrient boosting alkaline foods. By adding these high energy and nutrient dense resources to your diet and lifestyle, you’ll be providing the body with the vital resources it needs to rebuild alkaline buffers and construct new healthy red blood cells and body cells while you learn to take control of the lifestyle choices that have disturbed your inner environment and your cells (negative thoughts, words, and deeds, destructive emotions, dehydration, acidic diet, EMF, radiation, polluted environment, and poor elimination of body’s own wastes). Deep breathing, living alkaline fluids, and alkaline foods help the body eliminate acid wastes, lead to a balanced pH (higher levels of alkalinity) and a clean and clear inner terrain, which causes cellular organization giving rise to health and vitality as the “not so good stuff” gives you up – removing the need for will power. As you progress, the signs of health and vitality are expressed: clear bright eyes, energy and vitality, proper digestion and elimination, a lean trim body, mental clarity, concentration, and stable emotions. By focusing on deep breathing, living alkaline fluids, and nutrient boosting alkaline foods in the majority of your diet, you’ll be getting plenty of the 6 Vital Elements™: water, chlorophyll, alkaline minerals, healthy fats, soluble and insoluble fiber, and plant-based amino acids – power-packed nutrition that, along with daily exercise and enough rest, provides your body with everything you need to create and maintain the level of health and vitality you’re committed to and without forcing you to sacrifice the joy of living. Sit or lie comfortably and place your palms on your navel. Empty your lungs and breath in slowly through your nose as you imagine a balloon is inflating in your belly. Exhale slowly and fully through your mouth with a “haaaa” sound. Repeat 5-10 times per set. Determine how much water you should drink per day by dividing your total body weight by 50lbs which will give you the minimum number of liters or quarts you should drink per day to replace what you lose through normal activity plus some extra. If it will make it easier, you can split your water up into smaller servings, such as 12-16oz every 2-3 hours. If you really want to make an impact, structure your water with a electric water ionizer (www.VitalLivingWater.com) and add some type of green vegetable powder like pH Miracle Greens. In a blender, combine fresh greens, vegetables, fatty fruits (avocado and coconut), and sweet fruits with nutrient dense seeds like hemp, flax, and chia, along with fresh almond milk. Pre-pour them into 16oz Mason Jars and take them on-the-go in a travel cooler. Find out how and get recipes from the Bonus Green Smoothie Guide. 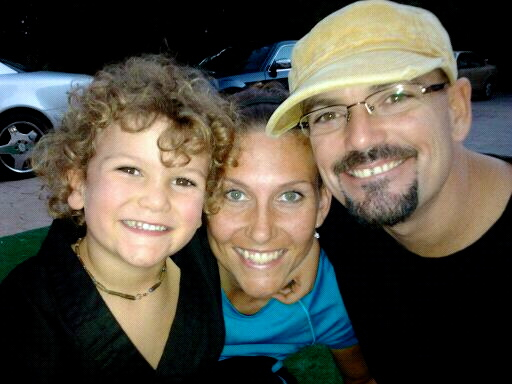 Jason and Nandi Moore are the creators of The Vital Life Blueprint, authors of The Vital Living Revolution, and founders of Vital Life Academy. As personal health and lifestyle coaches to some of the world’s most elite performers, they teach their clients how to break through mental, emotional and physical limitations to achieve REAL Health Freedom, Peak Performance, and a Limitless Life of VITALITY – without going to unnecessary or inappropriate extremes or sacrificing the joy of living. For Lifebook Members Jason is offering a Complimentary 1-Hour Vital Life Assessment by phone – to learn more and schedule an appointment, please visit https://www.timetrade.com/book/YN8PC. Previous PostYour Body Is Electrical and Runs On Electrons – NOT Sugar, Protein or Fat!Next PostResearch Reveals That Coconut Oil Is Great For Cleaning and Whitening Teeth! I am wondering and since all the info thus that I have read does not tell me. I have gotten so many opinions as to whether or not plantains are alkaline or not. Green ones. I had some in a soup and it was excellent.